The Presidential Guard says it has secured the Tripoli-Zawia stretch of the main coastal highway after recent military operations had cleared the Wirshefana region (Photo: PG). The Presidency Council/Government of National Accord (PC/GNA) created Presidential Guard (PG), the embryonic Libyan army in the west of Libya and the only army officially recognized by the international community, announced last week that it has secured the Tripoli-Zawia coastal road. This includes the key 17 km and 27 km checkpoints on that main road. A source who travels on an almost daily basis between Tripoli and Zawia told Libya Herald today that the PG were not stationed at the Janzour 17 km point but at the 27 km point, the Forsan point just before Zawia and at Sidi Billal in Sayaad. Speaking to Libyan media, PG Commander Najmi Nakua said that the securing of the main coastal highway represents an important step by the PG which represents ‘‘the law and the legitimate state’’. He said that previous attempts to secure the highway had failed because its security had been ‘‘divided up amongst different regional forces’’ (militias). But this time, it is ‘‘the legitimate state force of the PG that is securing the road’’. PG forces manning checkpoints along the much troubled main coastal highway between Tripoli and Zawia (Photo: PG). Nakua warned that ‘‘any attacks on the PG would be considered an attack on the legitimate state itself, and that all the capabilities of the state would be used to defend it’’. The action by the PG to establish its authority on this problematic main artery that leads from the nation’s capital all the way to the Tunisian border comes on the back of the recent military action in the Wirshefana area. The road and its users have been the subject of attacks and control by various militias and armed gangs which had over the years kidnapped passengers and their vehicles. 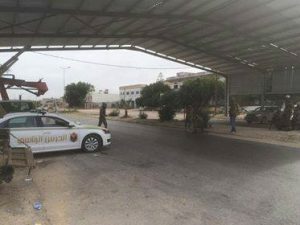 Various armed criminals and militias had also blocked off the highway forcing people to go on a semi-circle multi-hour detour to the south of the motorway in order to reach Tripoli and beyond. The road closures played havoc with Tripoli university students living to the west of the capital. Many had to stop attending studies. There have been numerous attempts to open the highway before, which for differing reasons ultimately failed in the long term. If the PG does indeed succeed in securing this stretch of highway it would be a huge boost to it and the Serraj PC/GNA. It would help boost his virtually non-existent domestic legitimacy. Critics would say that it should be imposing its control on much larger swathes of Libya if it wants to be taken seriously as the exclusive legitimate government of all of Libya. The PC/GNA Media Department and the Presidential Guard itself failed to respond to an invitation by Libya Herald to make further comments on this story.